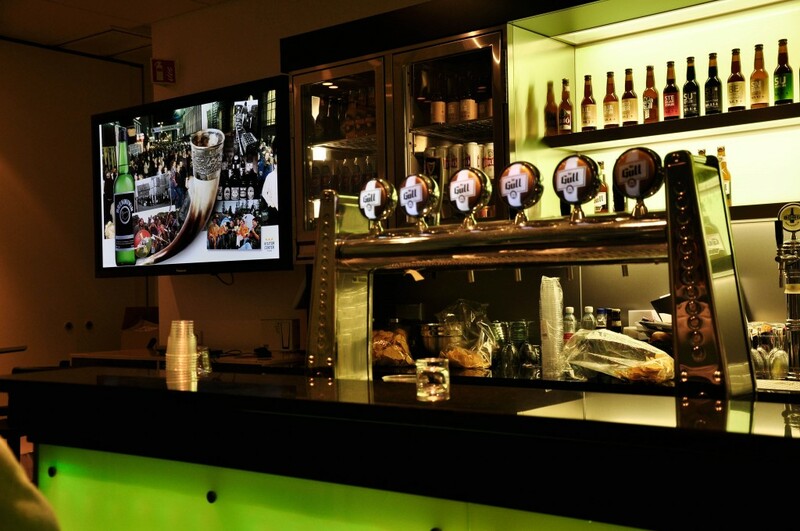 If you are in Reykjavik and don’t know what to do, the weather is bad and you have already done all the possible activities and seen all the possible sights in town, there is still a tour that is worth doing and that probably none of you has considered: the brewery tour Taste the Saga. The tour runs only a couple of times a week, mainly in the weekend, by Gray Line, around 5 in the afternoon. They bring you at the door of the town, in this huge brewery and factory that produces most of the beer and soda drinks of Iceland. You are welcomed in the bar of the brewery, nicely decorated with coloured lights and beers all around and with huge bowls of tortillas on the tables. 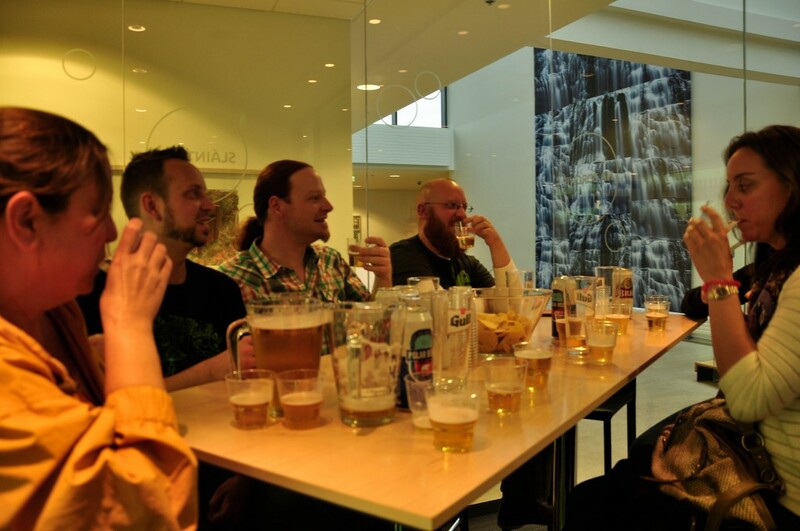 You don’t get why there is such a big amount of stortillas on the table until your guide, an extraordinary funny stand up comedian entertainer, starts telling you the history of beer and alcohol in Iceland and pouring you beer. I have done may brewery tours in life, both of whiskey and of beer, often learning a lot about how they make it, but this tour is totally different. 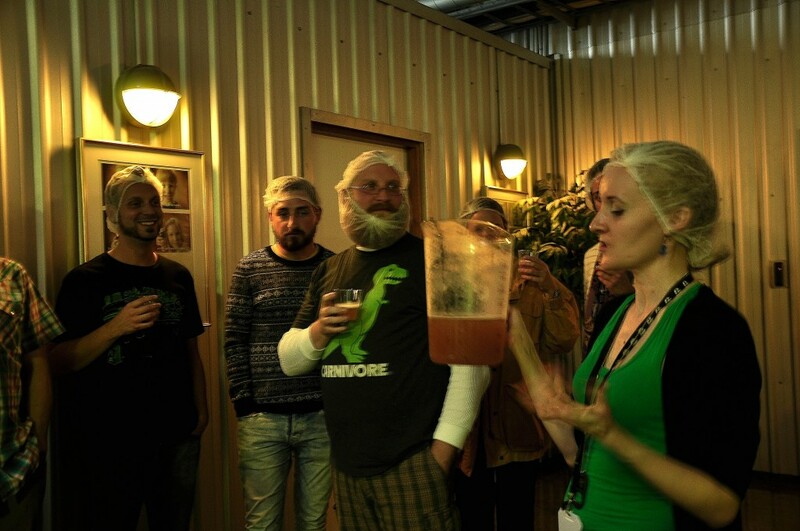 It is probably the most funny tour I have ever taken, and while you don’t learn much about how they make the beer ( you still don’t know how they make beer?) you learn a lot about the long and difficult history of alcohol in Iceland and, most of all, you drink a lot of beer. No other tour in the world gives so much beer. In Amsterdam at the Heineken Brewery tour you barely have a half pint of beer despite the very expensive ticket you pay at the entrance, and in Copenhagen at the Carlsberg, you are allowed to two glasses. Things don’t go better in Scotland at the whiskey tours, where they usually let you taste only a couple of whiskey shots during the tour,even though, over there, if you are lucky like I was to meet the drank barman of the whiskey brewery wile waiting your turn for the queue, things can change…but that’s another story…. 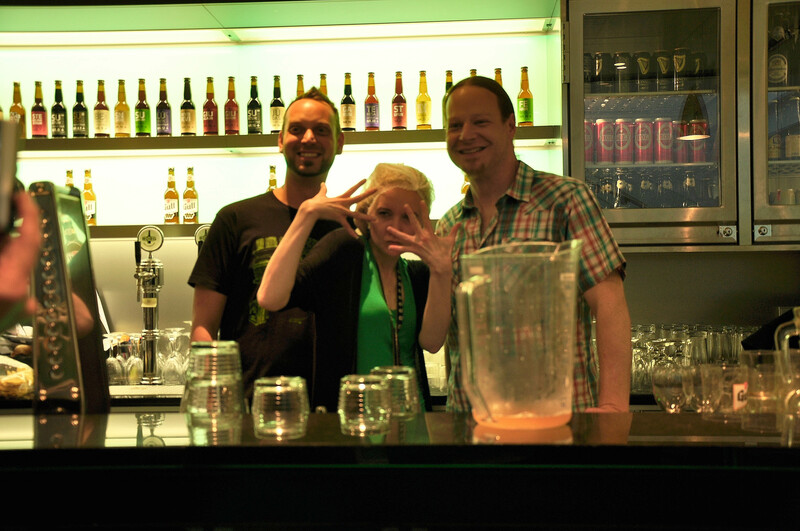 Back to Reykjavik brewery, as soon as the guide-comedian starts her narration, you are offered a first beer. I personally don’t like Gull a lot, but I have to admit that it was fresh, refreshing and bubbling the one I tasted there. 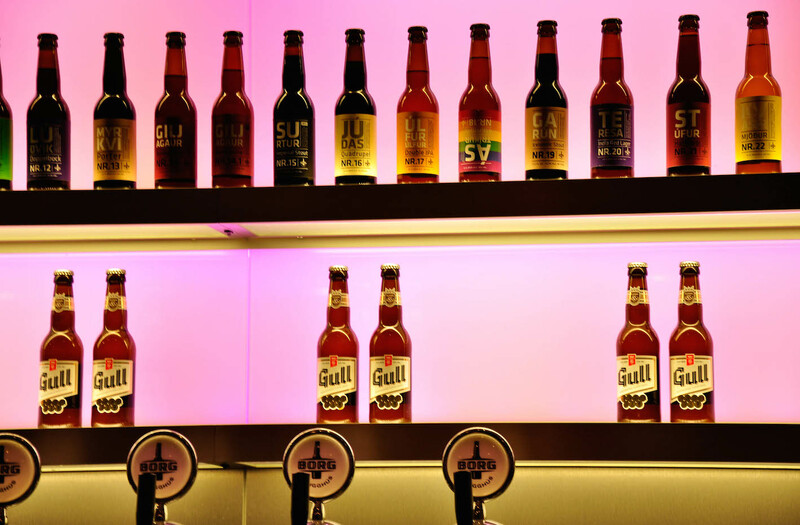 You haven’t even finished that one that you get to try another beer, called Boli, one of Icelanders’ favorites and a jar of Gull again. That’s the moment you start to eat tortillas chips and that’s also the moment the atmosphere becomes more friendly, with people getting tipsy and talkative. You look around and you see people are starting to become friends. 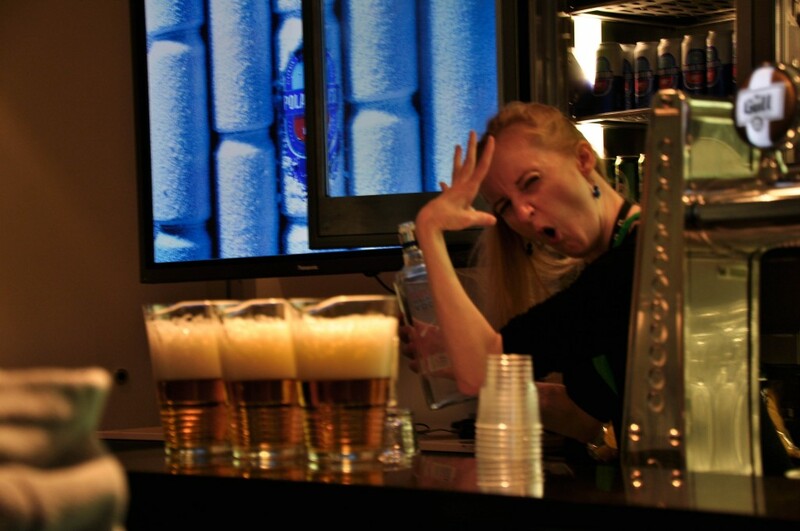 The story of the relationship between Icelanders and alcohol is a very weird one. On this land, people have been struggling all their history to make alcohol free.In a 1908 referendum, Icelanders voted in favor of a ban on all alcoholic drinks. In 1921, the ban was partially lifted after Spain refused to buy Iceland’s main export, fish, unless Iceland bought Spanish wines; so alcohol was still banned except for Spanish wines! During the WWII, when British troops were sent to Iceland they found a lack of beer. 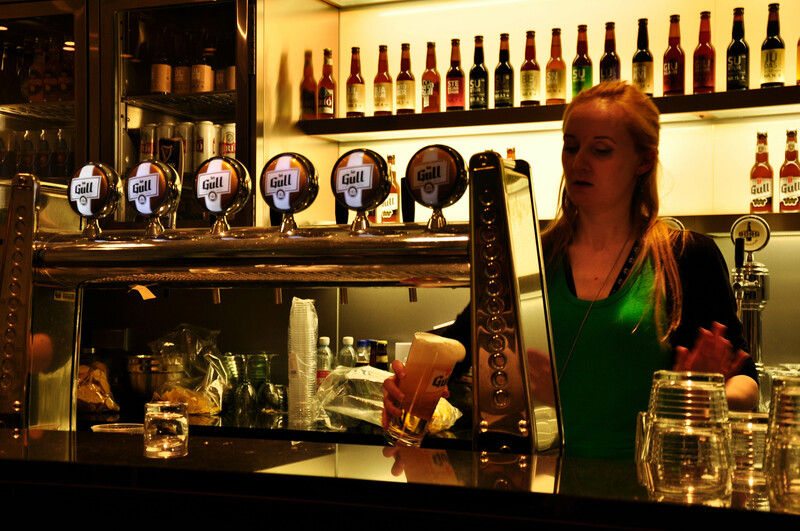 And although Icelanders were not allowed to brew, sell or drink beer for another 59 years, special provisions were made to make sure the soldiers would get their usual pint. 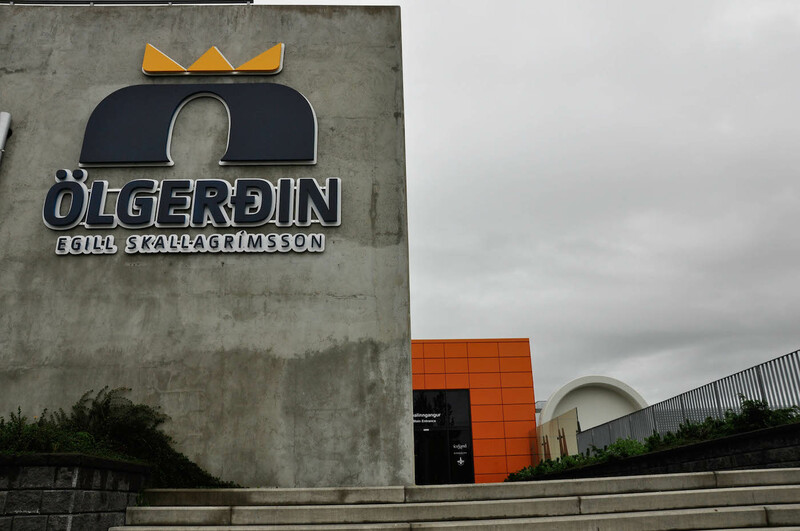 Ölgerdin, founded in Reykjavik in 1913, obtained a special license to brew strong beer, specifically for the British soldiers. 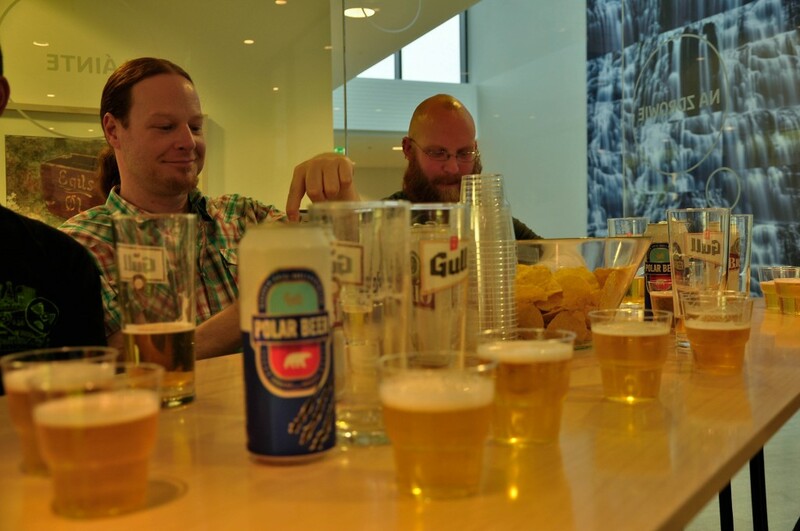 So the Polar beer was born. After the Americans replaced them, they were allowed to purchase Polar Beer as well, while the Icelanders were prohibited. It was only in 1989 that beer was declared legal. Our guide Sylvia, as she liked to be called instead of her unpronounceable Icelandic name, was a hurricane of craziness and fun, she was hilarious and entertaining and the best guide ever. 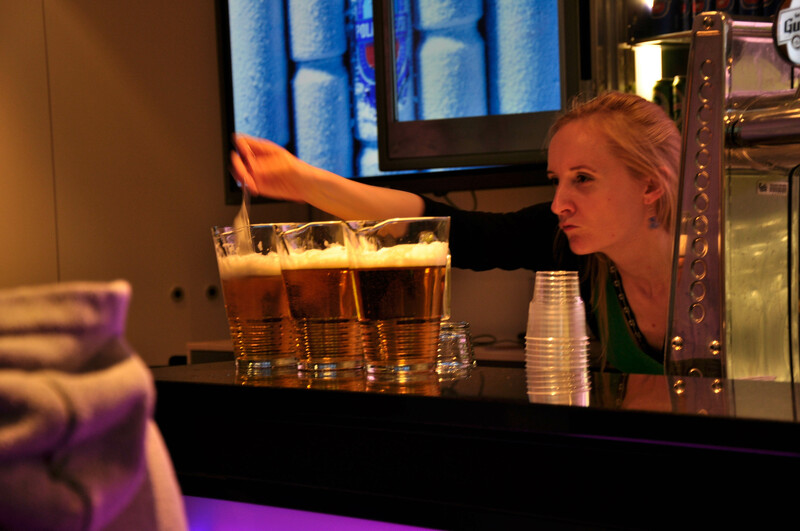 While she was talking and talking she never stop pouring us beer. We tried them all, after the Boli it was the turn of the Polar Beer, some special limited editions of beers produced according to special events or special celebrations and then the Pilsner, the real one with a shot of brennivin in it like in the old times and when we finally decided to go to see where the magic happens, where they produce the beer, I have to admit we were all happily tipsy. The tour in actual brewery was really short. You are brought in a space where there are big metal containers and they tell you there is beer in it but you don’t really see anything exciting and, to tell the truth, at that stage everyone is just worried to go back to the bar. At the exit of that area, just not to make you miss beer, the guide arrives with a huge jar of fermenting beer. The taste is sweet, some people like it and some not but they are all happy when Sylvia announces we can finally go back to the bar to have the last one. 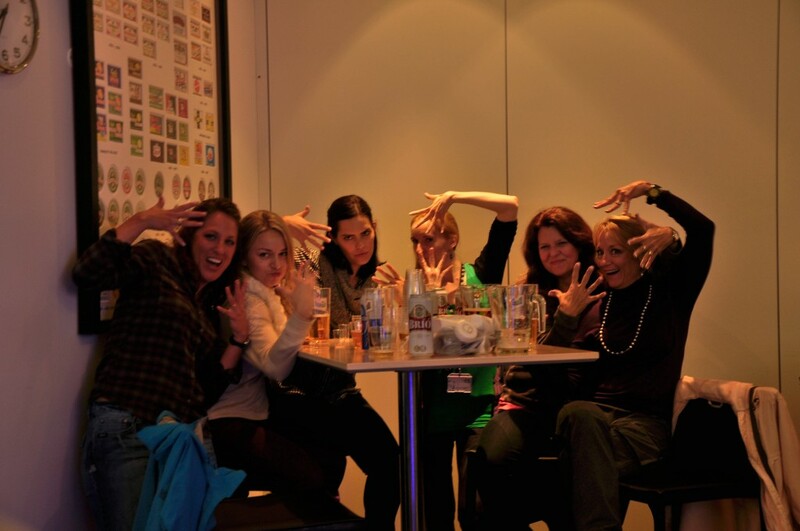 So the last few minutes at the bar are moments of great fun. People are tipsy, some busy finishing the last beer on the table , which is still in big amounts, and some talking photos with their new friends. The atmosphere is really amazing. I never had a tour like this. Everyone is happy and satisfied, you get what you pay for, plus you get the human touch that values much more than any other tour in the world. I’d rate this tour 10/10 for the atmosphere, the quality of people and beer, the price not so expensive and in general for the originality. It is a tour where the aim is not to show you anything special but rather to entertain you and give you a great time and a great memory. At the end they succeed it this greatly, they entertain you, and in order to do that they make sure they have great staff to do that; you will never ever encounter a better guide than in this tour and they offer you what they make it best, their beer. You will leave that place with a smile! And you will keep talking about it. And suggesting it to all your friends. Like I am doing it, now. Guaranteed. Se capitate a Reykjavik e non sapete cosa fare, il tempo non è dalla vostra o magari vi siete già cimentati in tutte le possibili attività da fare in città, c’è ancora un tour che vale la pena fare e di cui forse non avete sentito parlare: il tour della brewery Ölgerðin Egill Skallagrímsson, la fabbrica dove si produce la birra. Il tour è gestito da Gray Line e di solito avviene solo nei weekend. Gray Line vi conduce alle porte della fabbrica più grande e famosa d’Islanda, produttrice di birra e di altre bevande gassate, nel tardo pomeriggio. Alla fabbrica siete accolti nel bar della fabbrica, decorato graziosamente con luci colorate e birra e con grandi ciotole piene di tortillas sui tavoli. Vi chiederete allora perché quella quantità enorme di tortillas e sarà la prima domanda che farete alla vostra guida, un’attrice comica che è là per rispondere a tutte le vostre domande e che da lì inizierà il suo show, parlandovi della storia dell’alcol in Islanda. Ho fatto molti tour nella mia vita, sia di whiskey che di birra, imparando un sacco su come entrambi vengono creati e prodotti, ma questo tour è completamente diverso dal resto. Ed è probabilmente il più divertente mai fatto perché mentre non si impara granché su come viene prodotta la birra ( ma avete ancora bisogno di capirlo? ), si impara invece qualcosa sul rapporto che gli islandesi hanno con l’alcol. Inoltre, in nessun altro tour al mondo berrete così tanta birra come a Ölgerðin. Tornando alla fabbrica di birra di Reykjavik, appena la guida attrice comica inizia la sua narrazione, la prima birra arriva sul tavolo. Io personalmente non amo la Gull, la birra più famosa e comune d’Islanda, ma devo ammettere di non averne bevuto mai una così buona e rinfrescante come quella a Ölgerðin. Quando ancora si è alle prese con la prima pinta arriva subito una seconda, la Boli, una delle birre preferite degli islandesi, e con essa un’altra giara di Gull. E questo è il momento si inizia a sgranocchiare tortillas, una dopo l’altra, e a considerarla la migliore pensata del mondo. Questo è anche il momento in cui l’atmosfera inizia a sciogliersi e a diventare più amichevole, con le persone che iniziano ad essere un po’ brille e a chiacchierare tra di loro. La storia del rapporto tra gli Islandesi e l’alcol è molto strano agli occhi del resto del mondo. Gli abitanti di questo paese hanno aspettato per anni prima di far liberalizzare una cosa così normale come la birra. Nel 1908 gli islandesi con un referendum,votarono a favore del proibizionismo assoluto dell’alcol. Nel 1921 il divieto fu parzialmente revocato dopo che la Spagna si rifiutò di acquistare il principale prodotto di esportazione, il pesce islandese, a meno che l’Islanda non acquistasse vini spagnoli; l’alcol, così, rimase ancora vietato ad eccezione dei vini spagnoli! Durante la Seconda guerra Mondiale, truppe britanniche furono mandate in Islanda dove si trovarono faccia a faccia con una vera tragedia ai loro occhi: l’assenza di birra. E sebbene gli islandesi non fossero autorizzati a produrre, vendere o bere birra per altri 59 anni, furono date disposizioni speciali per assicurarsi che i soldati ottenessero la loro solita birra. Ölgerdin, fondata a Reykjavik nel 1913, ottene un permesso speciale per produrre una birra più alcolica, prodotta solamente per i soldati britannici. Nacque così la Polar Beer. La Polar Beer era legale per inglese e subito dopo per gli Americani, ma rimase proibita per gli islandesi, che invece dovettero aspettare fino al 1989 affinché il divieto fosse cancellato e la birra venisse dichiarata finalmente legale. 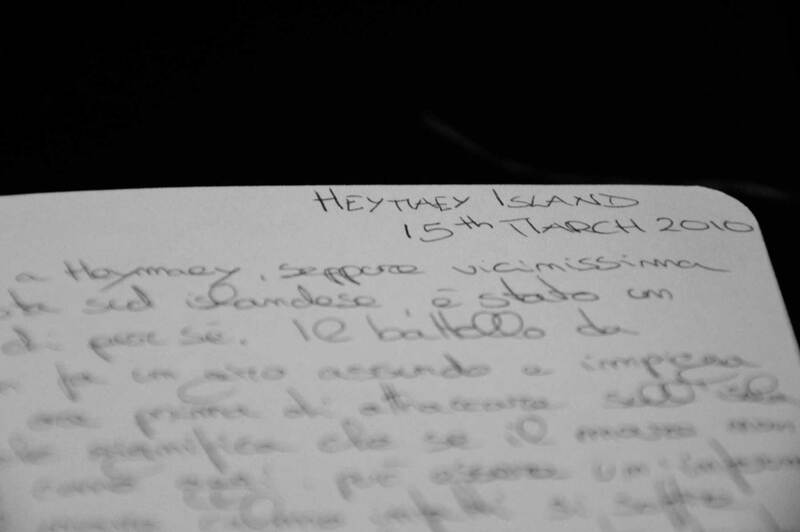 La nostra guida Sylvia, come le piace essere chiamata piuttosto che con il suo impronunciabile nome islandese, è stata un uragano di simpatia, esilarante e divertente, la considero la miglior guida mai avuta. Mentre continuava a parlare a raccontare storie, non smette di versare birra. In questo tour le si assaggia tutte. Dopo la Boli è stato il turno della Polar Beer, di alcune edizioni speciali prodotte per varie occasioni, poi la Pilsner, quella originale islandese, con uno shot di brennivin dentro come si faceva nei tempi passati, di modo che quando finalmente ci si è decisi ad andare a vedere dove la magia avviene, ovvero dove producono la birra, eravamo tutto già alticci. Il tour della fabbrica in sé è molto breve. Si viene condotti in uno spazio dove mostrano dei giganteschi contenitori in cui la birra fermenta. Non c’è niente di straordinario ed emozionante in questa parte del tour e, a dire il vero, tutti sono preoccupati solamente di ritornare al bar. All’uscita da quell’area, però, c’è un’altra sorpresa. La guida arriva con una giara gigantesca ripiena di birra ancora in fase di fermentazione. Alcuni la amano altri no. Altri la portano con sé al bar. Il sapore è dolciastro, simile al mosto. Si ritorna così tutti al bar, per gli ultimi momenti prima dell’arrivo dell’autobus che ci riporta in centro. Il tempo di finire tutte le birre rimaste sul tavolo ed avere un ultimo shot di brennivin, fare foto assieme agli altri, ormai divenuti amici, ed insieme a Sylvia. L’atmosfera è molto piacevole anche se sono tutti brilli. Non ho mai fatto un tour del genere. Ce en andiamo tutti felici e soddisfatti, i migliori soldi spesi in città con in più un tocco umano che rende l’esperienza uno dei migliori tour da fare al mondo. Voterei questo tour 10 su 10 per l’atmosfera, la qualità delle persone e della birra, il prezzo non costosissimo ed, in generale, l’originalità. Questo è un tour in cui lo scopo principale non è mostrare come si produce la birra, ma piuttosto intrattenere i visitatori e donargli un gran bel ricordo e una piacevole esperienza. E alla fine ci riescono perfettamente. Lo staff riesce ad intrattenere con un prodotto buono e una guida preparata e divertente. Si lascia questo posto con un sorriso. E si continua a parlarne e a suggerirlo ad altri. Proprio come sto facendo io, adesso. Garantito.